A frozen food diet helps you lose weight through portion control. The portions are measured for you. Why do portions matter? Because larger portions have more calories, and extra calories taken in means more fat on your body. If you're on a restrictive diet, but the scale's not moving, you might want to look at how much you're eating because, unfortunately, you can have too much of a good thing. Eating mashed sweet potatoes with dinner might fit your diet, but it's not going to help you if you eat a plateful of them. This is one of the biggest benefits of the frozen food diet. With prepackaged food, your choices are more limited. Nutritionist Laurie Beebe told Glamour, "This is the part of dieting many people find to be difficult . . . thinking too much about what they will have, so they just throw up their hands and eat whatever they want." Since it eliminates all the stress of having to figure out what to make, the frozen food diet may be easier to stick to, which means it's more likely to give you the results you want. U.S. News reports that, "The easier a diet is to follow, the better the odds of sticking to it." It can't get much more convenient than having your foods already prepared and ready to eat within minutes. For the busiest dieters, this is of huge importance. No more time spent looking up recipes, wandering around the grocery store looking for ingredients, no more time spent cooking. The Atkins diet and the Ornish diet may get you quick results, but they may also become boring to eat. According to research done at the University of Pennsylvania, "Concerns about reductions in the taste quality of the diet are the most often mentioned obstacles to adopting reduced-fat and healthful diets." Frozen foods are pre-made meals, so the taste quality of your diet won't be severely diminished. With any diet, there are always drawbacks. Pre-made, healthy and tasty meals don't come cheap. The more variety and taste you look for, the more expensive they can be. While there are some frozen food programs that are simply real meals that are portioned and frozen, those can be hard to come by (and are more expensive!). Most portion controlled frozen food does come packed with preservatives and sodium. If you are buying prepackaged meals, you don't get as much control over your choices. If you hate onions, you might not be able to request "no onions" in your meal. You also may have to eat foods you don't like to get the calories because those were offered in your meal package. The frozen food diet is ideal for the busy dieter who doesn't have time to plan and cook each meal for himself or herself. It is best for dieters who don't have dietary restrictions due to medical reasons or strong personal preferences as it may be difficult to find meals that fit your restrictions. It's also a great choice for the dieter who tends to get bored on diets and finds that he or she just eats the same foods over and over, or for the dieter who misses foods like lasagna and pizza, since those foods are allowed on this diet as long as they're from the frozen foods section of the grocery store. Stock up before you start the diet. Go to the grocery store and pick up enough frozen meals to last you until your next trip - five to seven frozen breakfasts, and 10-14 frozen lunch/dinner entrees. Buy some fresh fruit and vegetables since you can use those as snacks between your meals without ruining your diet. Choose meals from different brands and pick different dishes so that you don't get bored - after all, having lots of variety is one of the perks of this diet! Be careful of picking meals with too few calories as that will leave you hungry. Additionally, be sure to avoid meals with too many calories, such as some of the Hungry-Man meals that can cost you over 1,000 calories per serving. Beebe recommends that each meal be about a third of your daily caloric intake. Pick meals that come with only one serving per package. If you picking a frozen dinner for two, or a family-size entrée, you might mis-measure the portions and lose the benefit of portion control. For the most part, look for meals with lots of vegetables instead of picking meals with just a starch and protein or just a starch. Want to learn more about the frozen food diet choices? Take a look at these resources. I Love This Diet - This dietician-designed program gives you access to member resources such as a diet handbook, frozen food reviews, and a member support forum where you can talk with others about your progress. 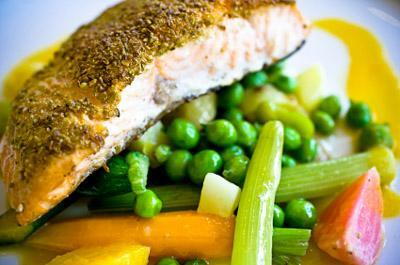 Amy's Diet Plan - Amy's frozen meals typically have a lot of vegetables, and they often rank high in taste as well. On this site, Amy's and its staff dietician walk you through a frozen foods diet supplemented with fresh fruit and vegetables. The Best Frozen Meals Under 400 Calories - Shape picks 10 tasty meals under 400 calories to prevent you from feeling deprived and to help keep your diet on track. Good Housekeeping's 14 Favorite Healthy Meals - For meals that are under 400 calories, have no trans fat, and have a healthy level of sodium and saturated fat, look here. The Best Frozen Meals for Weight Loss - Eight choices from Everyday Health with nutrition breakdowns and explanations of why they are good for weight loss. Health's 13 Healthy Frozen Dinners - For some great-tasting meals that don't sacrifice nutrition, take a look through this list. If you've tried many diets and had trouble sticking with them because you got tired of measuring and counting, or because preparing your meals took too long, or because there wasn't enough variety, consider the frozen foods diet. It may be just what you need. And with the tips and resources above, you'll have no problem getting the results you want!